FIFA 16 not only has women in it but they’re going to be on the front cover, just as if they constituted about half of the human race and participated in equally exciting but dramatically undervalued high level sporting endeavours. Amazing! 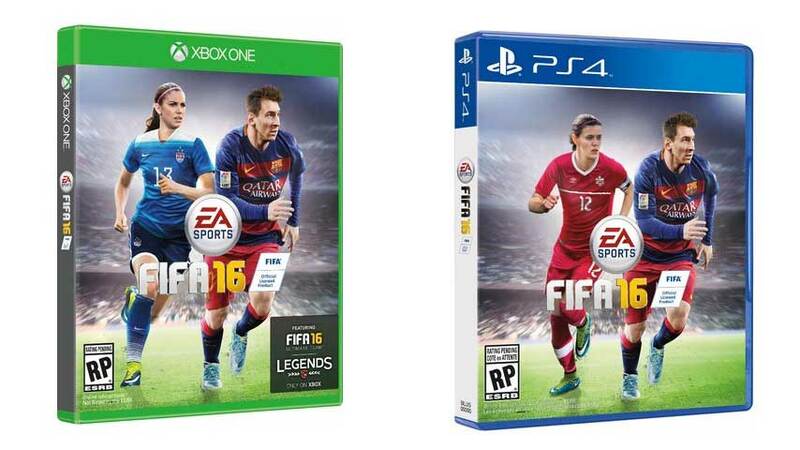 EA Sports has revealed FIFA 16 cover stars for a number of different territories, and to my personal delight and satisfaction several of them feature female athletes. FC Barcelona’s Lionel Messi is the global cover star, of course, but in the US he’ll be joined by gold medal-winning Olympian Alex Morgan, a member of the winning 2015 FIFA Women’s World Cup squad, the 2012 US Soccer Female Athlete of the Year and FIFA World Player of the Year nominee. You may remember her scoring the winning goal in the 2012 London Olympics final. National team captain Christine Sinclair will grace the Canadian cover, which was an obvious choice given the many, many honours the all-time leading Canadian scorer has won – 12 Canada Soccer Player of the Year award awards, six FIFA World Player of the Year nominations, Lou Marsh Canadian Athlete of the Year 2012 and Bobbie Rosenfeld Canadian Female Athlete of the year 2012. Australian fans voted in Stephanie Catley, one of the youngest players ever to debut in the senior national league. At 21, she had already racked up 32 appearances with the national squad, the Matildas, leading to her inclusion in the 2015 FIFA Women’s World Cup squad. She signed with the Portland Thorns last year. Everyone else is wall-to-wall dudes, and if you’re a FIFA fan it’s almost certain that you already know all about them and don’t need my hasty summaries. It’s a little disappointing to see the UK and Japan didn’t get a woman on there, given both national teams put up an incredible fight at the world cup. FIFA 16 is coming to PC, PlayStation 3, PS4, Xbox 360 and Xbox One in September.